The roots of our field go back to the 19th century. The ensuing timeline of legislation, court rulings, IRS determinations, events, activities and organizational development sketch the highlights of fiscal sponsorship’s history, factors that have helped it grow or change direction. The U.S. Supreme Court determined in an 1883 ruling that federal tax law requires the beneficiaries of a charitable contribution to be indefinite. 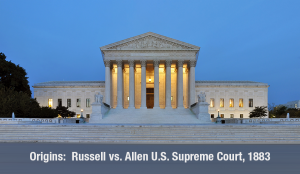 1883 — Russell vs. Allen. 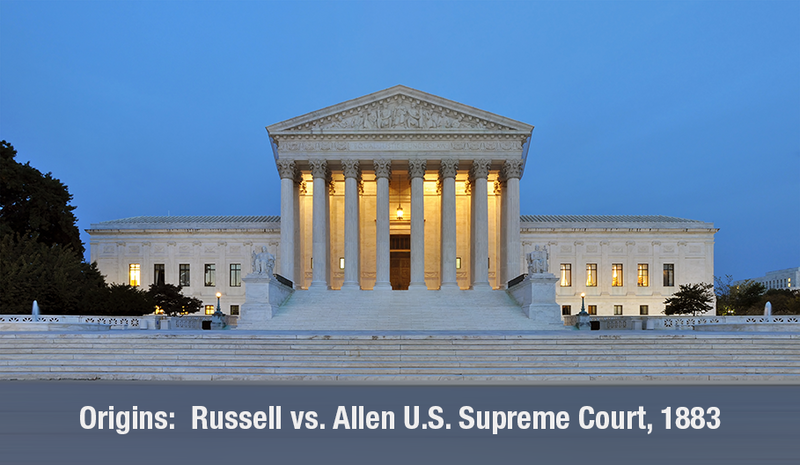 U.S. Supreme Court determines on March 5 that federal tax law requires the beneficiaries of a charitable contribution to be indefinite, the intended activities and services available to all. 1959 — Massachusetts Health Research Institute, now Third Sector New England — the anchor for East Coast fiscal sponsors and a pioneer in the field — incorporates and immediately takes on its first fiscally sponsored project. 1963 — IRS ruling, enacted January 1, establishes that a donation is not tax-deductible unless the recipient is a charity. It declares that when a charity acts only as a conduit or establishes a pass-through arrangement to receive a donation earmarked for a noncharity, that arrangement will result in loss of tax deduction for the donor (Revenue Ruling 63-252). 1966 — IRS Revenue Ruling 66-79 approves funds solicited for and regranted to a foreign charity for a specific project as tax deductible if the U.S. charity exercises “discretion and control” — ensures that those funds are used to carry out the charity’s function and purposes. 1969 — The most significant development in fiscal sponsorship since 1954 was Congress amending the Internal Revenue Code by dividing 501(c)(3) organizations into public charities and private foundations. As a result, public charities became magnets for sponsored projects, spawning the growth of fiscal managers mistakenly called fiscal agents. This popular term suggested the manager works for the project instead of having sole discretion for the charitable contributions. 1973 — Tom Silk opens a law practice in San Francisco, develops early theories of proper fiscal sponsorship under federal tax law by providing advice and representation in IRS controversies; his firm grew into Silk, Adler & Colvin. 1987 — National Foundation vs. U.S. Court of Claims case approves a prototype of public charity that houses multiple donor-advised funds and sponsored projects. The organization splits into three entities that still operate: National Heritage Foundation, Congressional District Programs, and Charity Admin Inc. National Heritage Foundation and Congressional District Programs have agency profiles in this directory. 1989 — “Use of Fiscal Agent: A Trap for the Unwary,” essay by John Edie, published by the Council on Foundations. Cautionary tale at a time of growing interest in fiscal sponsorship. IRS issues technical advice memo after a “fiscal agent” almost loses its 501(c)(3) exemption when one of its sponsored project’s activities is connected to the 1984 presidential campaign. 1991 — Series of meetings to collect and share information on sponsorship practices leads to grant support from the San Francisco and Wallace A. Gerbode foundations for a definitive book on fiscal sponsorship. 1993 — Fiscal Sponsorship: 6 Ways to Do It Right by attorney Greg Colvin is published by San Francisco Study Center. The book comprehensively explains why “fiscal agency” mislabels the funder-sponsor-project relationship. The change in nomenclature transforms the field and helps to professionalize the practice of fiscal sponsorship. 1994 — IRS Continuing Professional Education textbook states there is “nothing inherently wrong with fiscal sponsorship …,” which puts IRS acceptance on the record. 1994 textbook published July 1993. 1996 — Free-standing, multipurpose fiscal sponsor corporations established: Tides Center (Tides Foundation’s first fiscal sponsorship was in 1976), Community Partners in Los Angeles and Community Initiatives Fund of The San Francisco Foundation. 2002 — Fractured Atlas, now the largest fiscal sponsor, becomes first fiscal sponsor to do almost all of its business online, an increasingly popular model. 2003 — Tides Center examines fiscal sponsorship as a mechanism to support nonprofit innovation. 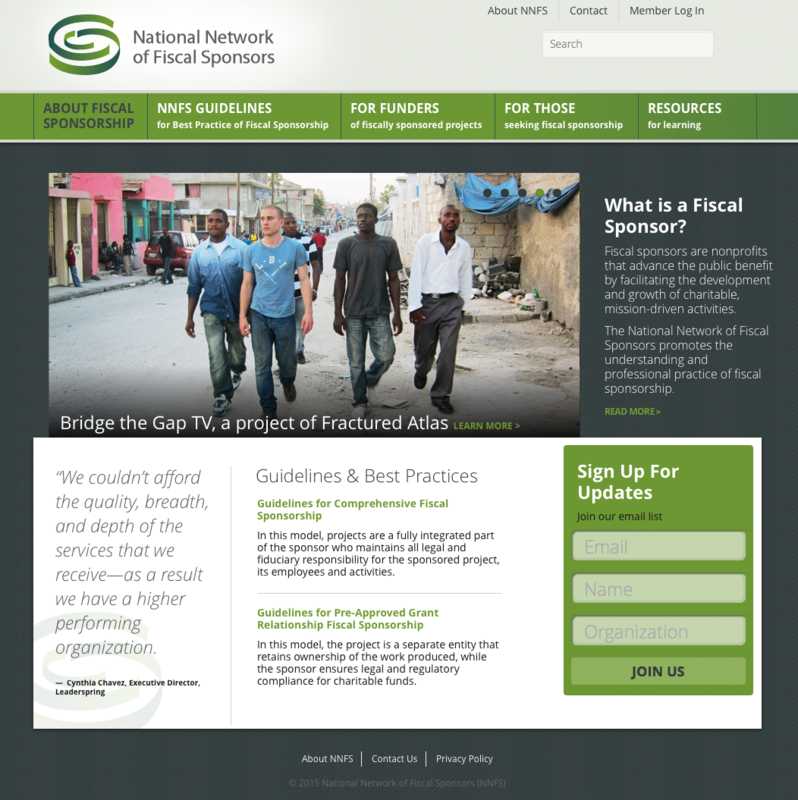 2004 —Based on Tides’ study, eight fiscal sponsors — the Steering Committee for what would become the National Network of Fiscal Sponsors — begin meeting to help define and build understanding of fiscal sponsorship. 2005 February — W.K. Kellogg Foundation awards $4.07 million grant to Tides Center to expand its fiscal sponsorship capability. December — Fiscal Sponsorship: 6 Ways to Do It Right, second edition, is published by San Francisco Study Center. 2006 February — Fiscalsponsorship.com, Website of Greg Colvin, attorney and author of Fiscal Sponsorship: 6 Ways to Do It Right, is launched to explain developments in the field and as a companion resource to his book. April — The Schwab Fund for Charitable Giving awards $50,000 grant to San Francisco Study Center to create an online directory of fiscal sponsors. May — Using funds from the 2005 Kellogg grant, National Network of Fiscal Sponsors launches field scan to gather first comprehensive data on fiscal sponsors. August — Congress passes Pension Protection Act, with amendments to Internal Revenue Code affecting donor-advised funds and fiscally sponsored projects by imposing new excise taxes in some financial transactions. 2007 — National Network of Fiscal Sponsors inaugural gathering in Los Angeles in October. 2011 — Description of new Model L published. In this model, the fiscal sponsor acts as the sole member of an LLC, a limited liability company, and the project is operated from within this separate entity; if properly done, the sponsor should have no liability for LLC’s debts and obligations. 2012 January — International Humanities Center in Woodland Hills Calif., a fiscal sponsor for 200 projects, fails, attracting public and regulatory attention. Losses to projects were estimated at more than $1 million. 2012 June — An advisory committee to the IRS Exempt Organizations office recommends fiscal sponsorship as an alternative to the growing number of nonprofit corporations being formed and seeking IRS approval of their 501(c)(3) exemption. 2012 August — IRS publishes Notice 2012-52, which clarifies that donations to a 501(c)(3)’s single member LLC (as in Model L) are deductible. 2013 — Resulting in part from International Humanities Center failures, AB 2327 takes effect in California. It requires charitable organizations with both restricted net assets and negative unrestricted net assets at the end of the year to explain their compliance with charitable trust responsibilities and to show the state attorney general’s office proof of its officers and their liability insurance. 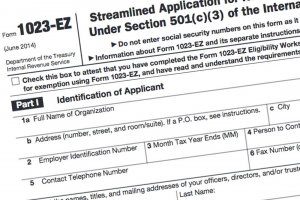 IRS form 1023EZ was introduced in 2014 and allows for streamlined application for federal tax exemption. 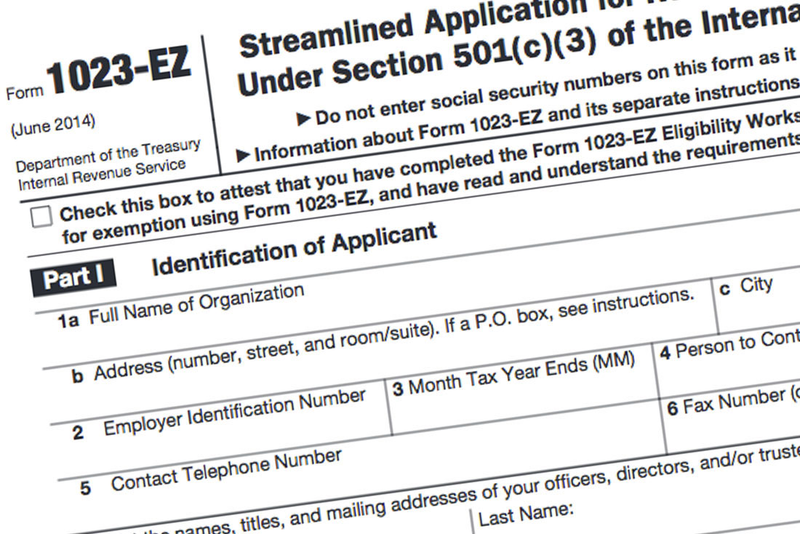 2014 — IRS introduces Form 1023EZ for community groups with incomes below $50,000 seeking to become tax-exempt charities based on a three-page application and $400 fee. 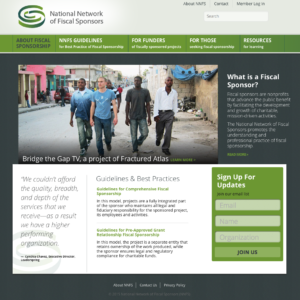 2015 — National Network of Fiscal Sponsors conducts second field survey of sponsors to track growth and change in the field. 2015 March — Kindle edition of Fiscal Sponsorship: 6 Ways to Do It Right published.